If you are looking literature with a distinct edge, then J.G. Ballard is your man. The legacy of this British author (1930-2009) has become a little clearer in the past couple of years. His books still have a following and interest has not dimmed. 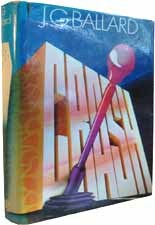 A new generation have picked up the likes of Crash to discover why this novel shocked their parents. Ballard wrote more than 15 novels and countless short stories. His style verged into the dystopian and bleak scenarios are commonplace. Crash and Empire of the Sun remain his best known works, but there’s plenty more - Cocaine Nights and Super-Cannes are also well worth a read. Crash was infamous for its subject matter, sexual desire stimulated by car accidents, and went on to become a controversial David Cronenberg film. Empire of the Sun was a story based on his childhood in a Japanese prison camp during World War II where he was interned for three years along with his parents and sister. Ballard published his first novel, The Wind from Nowhere, in January 1962 but he never liked the book even though it put his foot in the literary world’s door. His second novel, The Drowned World, established him as an up-and-coming figure among the so-called New Wave science fiction writers. Some people have said Ballard’s writing set the scene for Cyberpunk. This can be observed in many of his works including the often praised Vermilion Sands - where all of the stories are set in a desert town which features technologies such as bizarre poetry-composing computers and self-painting canvasses – or Memories of the Space Age which explores the psychological fallout from the space exploration frenzy of the 1960s and 1970s. Ballard’s continued to receive critical praise late into his writing career for novels like Cocaine Nights and Super-Cannes, which both feature communities with dark secrets. Ballard never shied away from controversy. Following the death of his wife in 1964, he began to write The Atrocity Exhibition. His publisher, Doubleday, was forced to destroy almost its entire original print run due to widespread criticism of the book’s content. With chapters entitled ‘Plans for the Assassination of Jacqueline Kennedy’, ‘Love and Napalm: Export USA’ and ‘Why I Want to F*ck Ronald Reagan’, The Atrocity Exhibition was considered a slur on the Kennedy legacy by the Americans. Ballard continued to write after he was diagnosed with terminal prostate cancer in 2006 and his autobiography, Miracles of Life, was published in 2008. What's the most memorable J.G. Ballard story plot?